Download "WHY YOU SHOULD USE ALL WASHINGTON LEGAL CLINIC OF SEATTLE/TACOMA/EVERETT"
2 ALL WASHINGTON LEGAL CLINIC OF SEATTLE/TACOMA/EVERETT SEATTLE OFFICE: TACOMA OFFICE EVERETT OFFICE: 212 Pioneer Building 1119 Pacific Avenue Suite First Avenue Suite Colby Ave. Seattle, WA Tacoma, WA Everett, WA (206) (253) (425) CONTENTS: A LEGAL SERVICE PROVIDED BY: TOM S. HYDE ATTORNEY AT LAW SECTION 1. SECTION 2. SECTION 3. 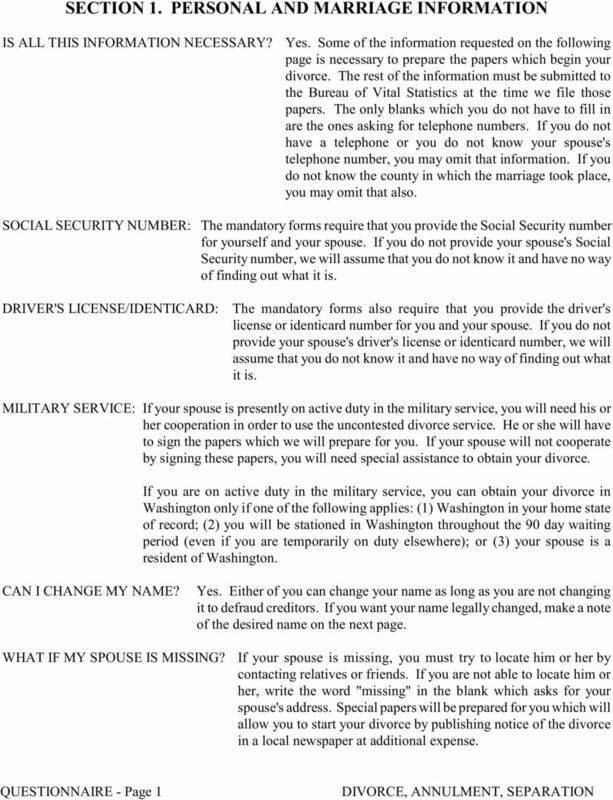 PERSONAL AND MARRIAGE INFORMATION -- PAGE 1 -- This section concerns the basic information necessary to begin your case. 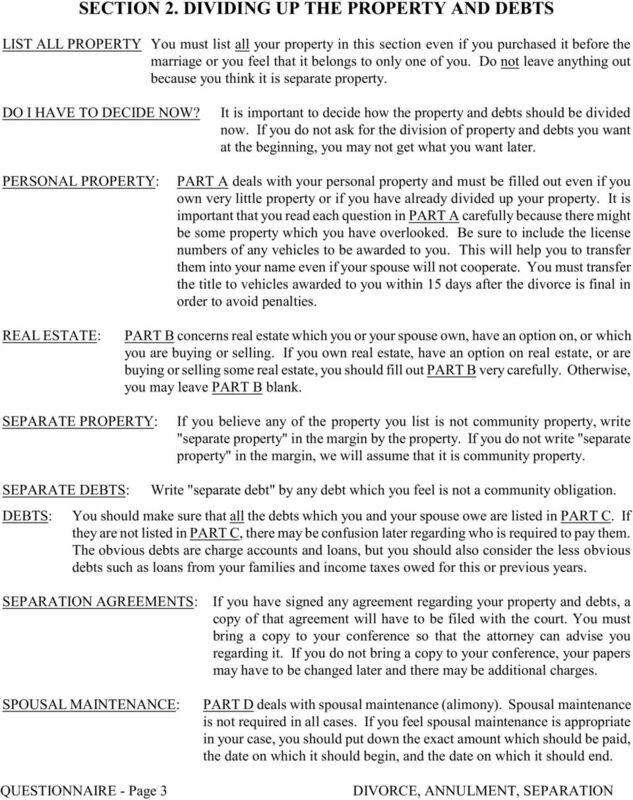 DIVIDING THE PROPERTY AND DEBTS -- PAGE 3 -- This section divides up the property owned by the wife and the husband as well as the debts owed by either or both. 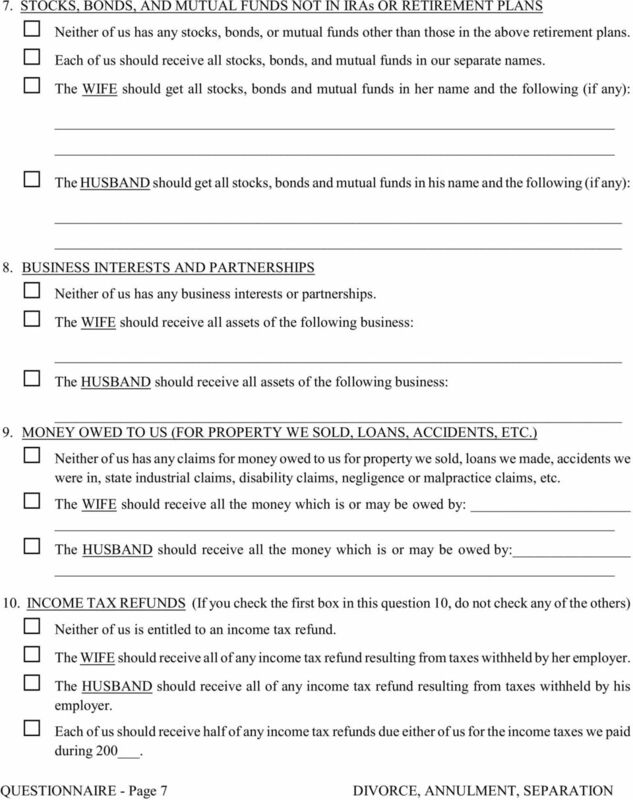 You should fill out this section even if the property has already been divided up or the property was owned before the marriage. 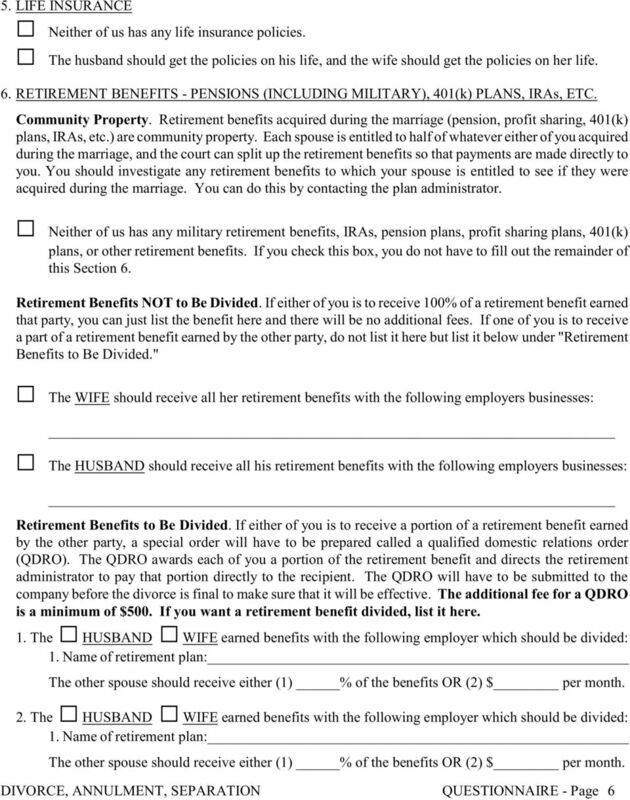 INSTRUCTION LETTER -- PAGE The letter on the back of this questionnaire sets out the terms of your agreement with Tom S. Hyde. You should read this letter carefully. It must be signed before we can begin work on your divorce. 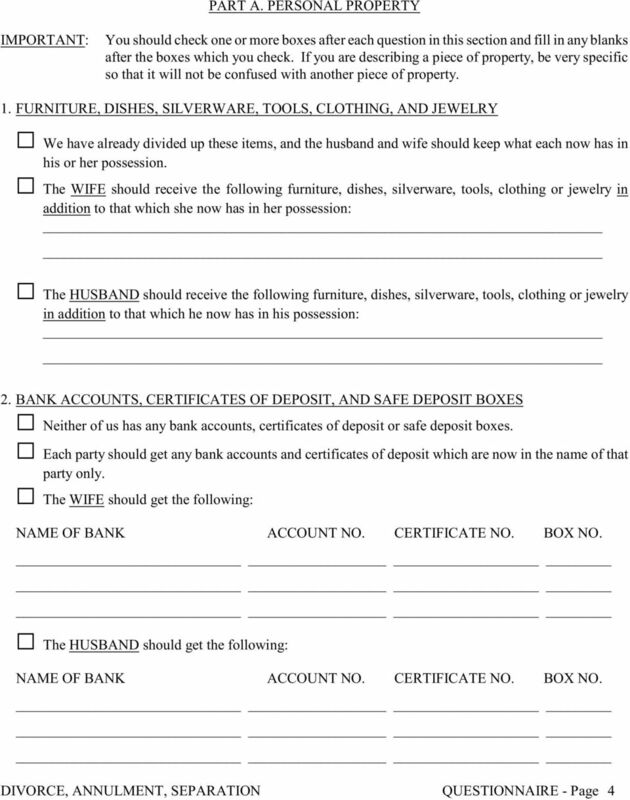 NOTE: YOU SHOULD NOT USE THIS QUESTIONNAIRE IF THE WIFE IS PREGNANT OR IF THERE ARE ANY DEPENDENT CHILDREN OF THIS MARRIAGE. The following dependent children are considered children of this marriage and must be listed in this section: (1) children born or conceived during this marriage; (2) children adopted by one or both of you during this marriage; and (3) children born before the marriage if the husband and wife are the parents of the children. Generally, a dependent child is one who is not married or otherwise self-supporting. A child who is under age eighteen or still attending high school should be listed as a dependent child unless the child lives outside the family home and is married or self-supporting. A child who has graduated high school and is eighteen years or older is normally not considered dependent, but you may agree that the child is dependent and that support should continue longer because the child has some special needs or is attending college and needs assistance with educational expenses. 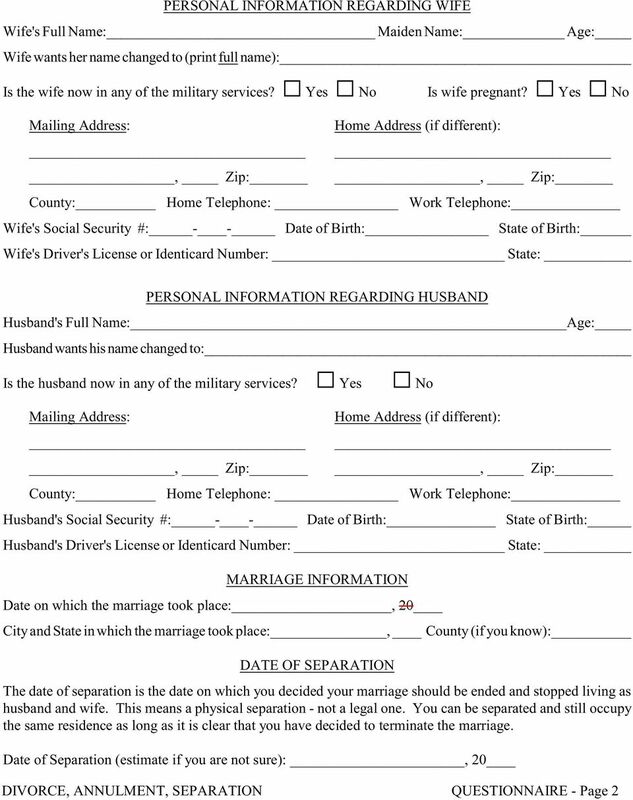 If the wife is pregnant or if there are dependent children of this marriage, you should return this questionnaire and pickup up the correct questionnaire. 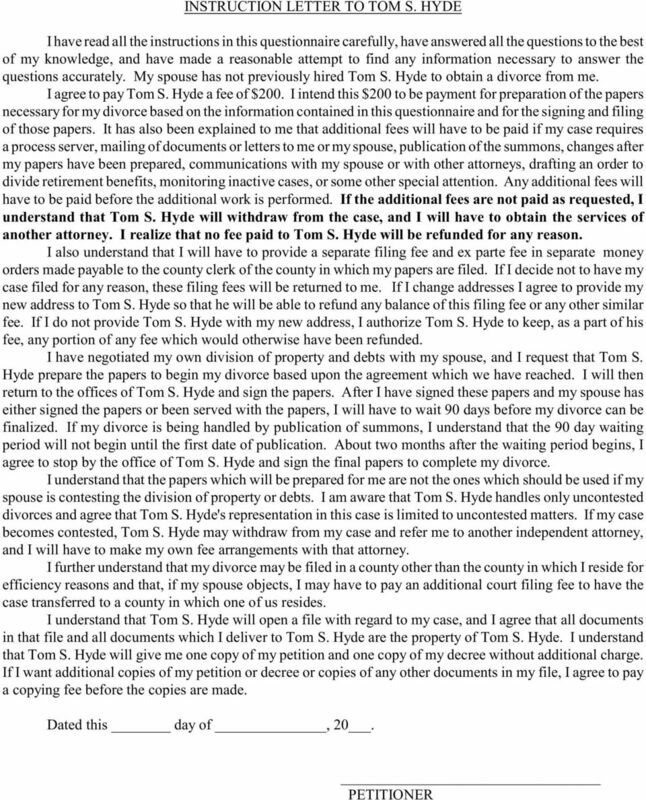 3 FEES The following is the attorney fee charged by Tom S. Hyde for an uncontested divorce, legal separation or annulment without dependent children of this marriage: $200 In order to avoid delays, you should pay this fee in cash,money order, debit or credit. Personal checks delay the filing of your case up to three weeks. Filing Fee: The court also charges a filing fee of $290. That fee will have to be paid at the time you want your case filed with the court. There is a $30 ex parte fee for not appearing in court. There is a $75 fee for checks which are returned for any reason. If you want a copy of your questionnaire for your records, you should make one before you return it. If you want us to make a copy of your questionnaire for you, you should bring an additional $25 in cash or a money order. 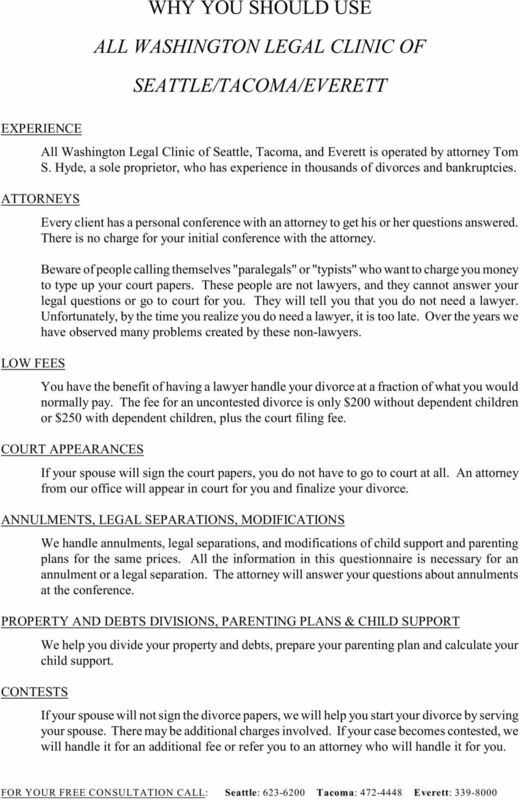 PROVIDING INFORMATION SAVES YOU MONEY All Washington Legal Clinic of Seattle, Tacoma, and Everett offers you an attorney's help in obtaining your divorce at a very low fee. We can do this only if you will take the time to provide us with all the requested information before you meet with the attorney. This questionnaire is designed to help you save money by collecting all the necessary information before your meeting with the attorney. Consequently, it is very important that you read and carefully follow the instructions in this questionnaire. If the information you provide at your meeting with the attorney is incorrect or incomplete, your papers will have to be changed and you will be charged additional fees of $200 or more. 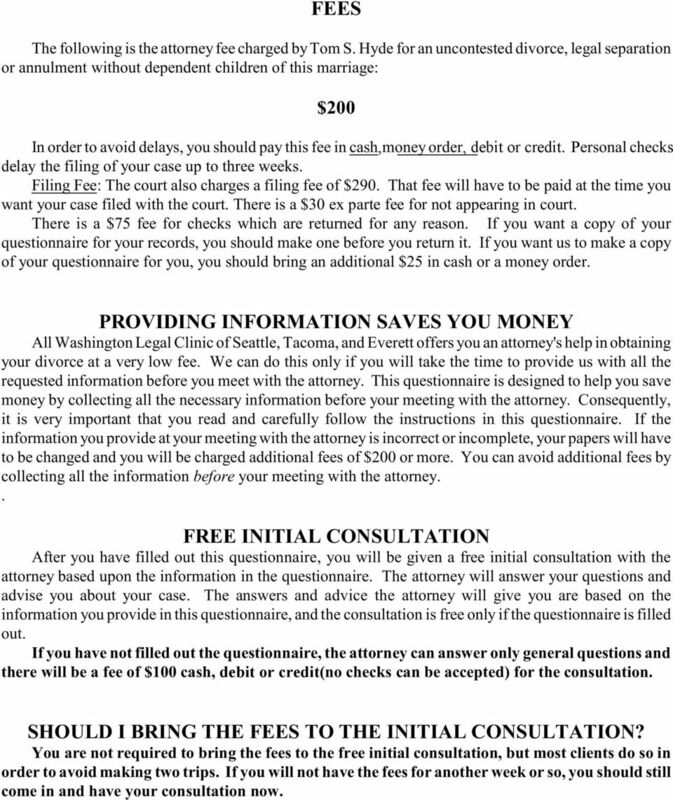 You can avoid additional fees by collecting all the information before your meeting with the attorney.. FREE INITIAL CONSULTATION After you have filled out this questionnaire, you will be given a free initial consultation with the attorney based upon the information in the questionnaire. The attorney will answer your questions and advise you about your case. The answers and advice the attorney will give you are based on the information you provide in this questionnaire, and the consultation is free only if the questionnaire is filled out. 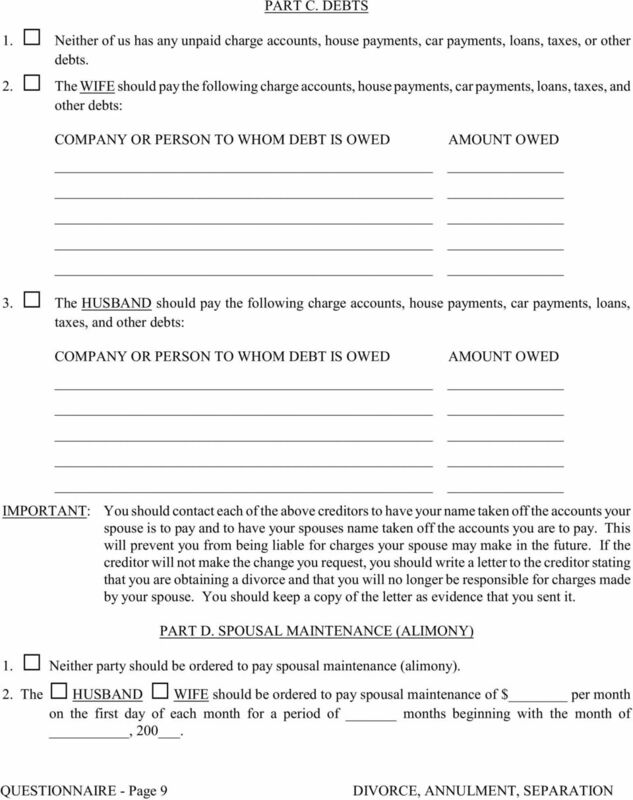 If you have not filled out the questionnaire, the attorney can answer only general questions and there will be a fee of $100 cash, debit or credit(no checks can be accepted) for the consultation. SHOULD I BRING THE FEES TO THE INITIAL CONSULTATION? You are not required to bring the fees to the free initial consultation, but most clients do so in order to avoid making two trips. If you will not have the fees for another week or so, you should still come in and have your consultation now. RAMOS LAW FIRM. 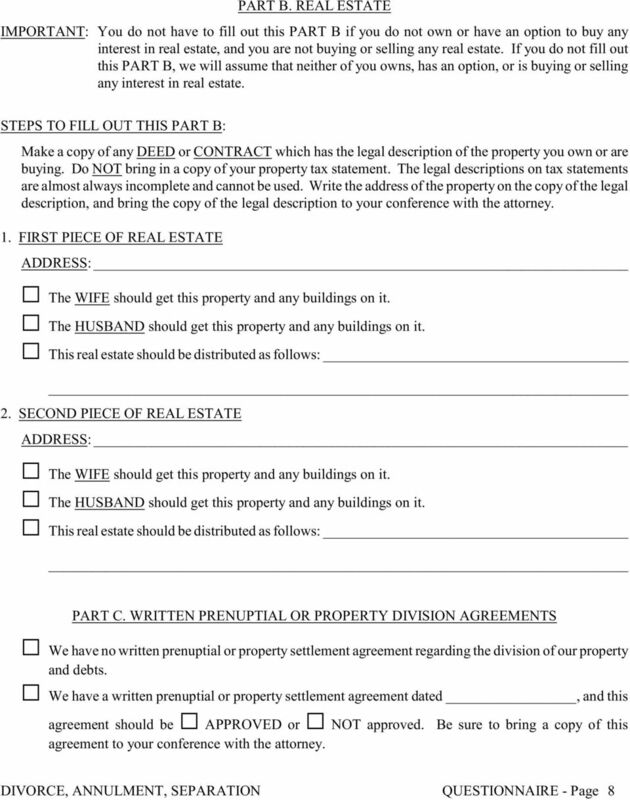 This is the uncontested divorce contract for all parties with an agreed divorce. Unauthorized use of this contract is prohibited. 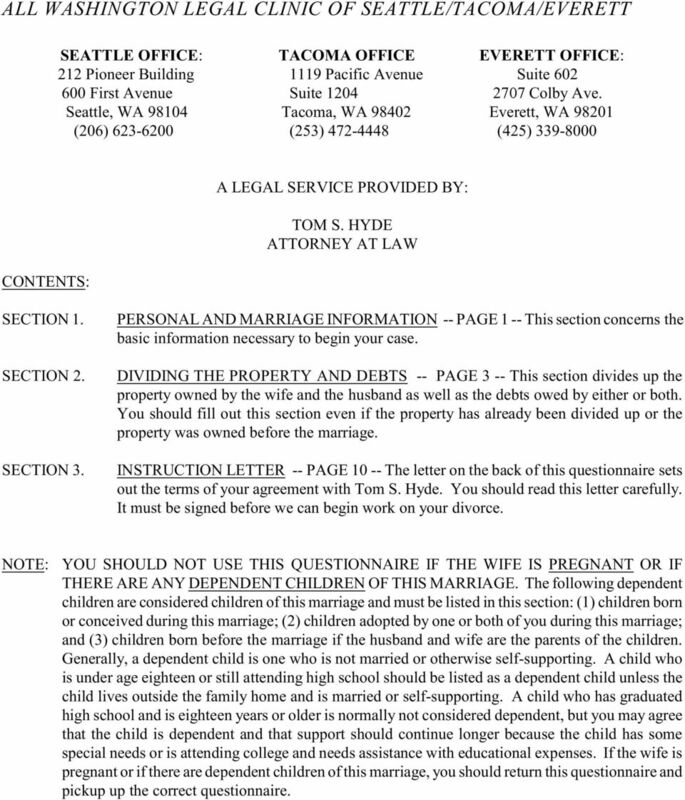 Print court information exactly as it appears on your Petition for Divorce Cause Number: IN THE MATTER OF THE MARRIAGE OF Petitioner: Print first, middle and last name of the spouse filing for divorce. 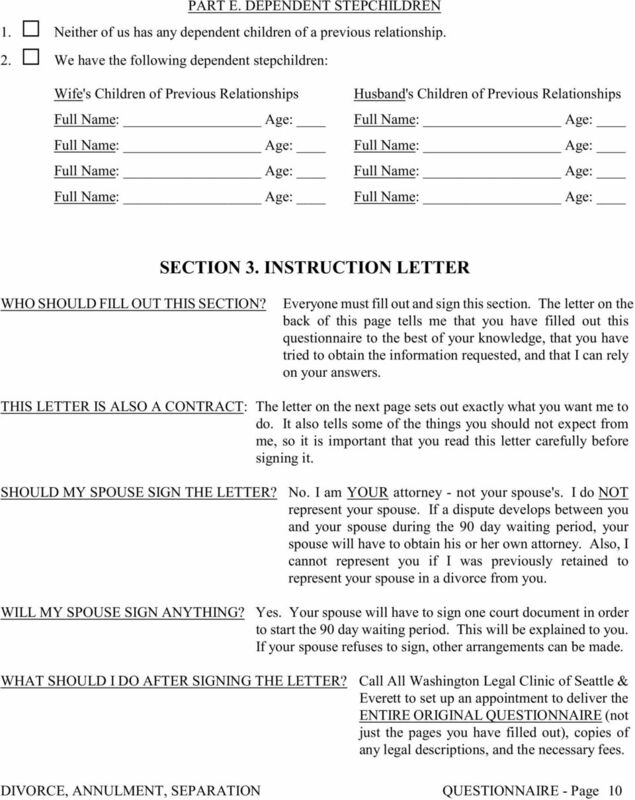 DIVORCE INFORMATION SHEET Date: Client Information: Full Name (Last, First, Middle): Full Current Address:,, COUNTY OF RESIDENCE: Home Phone: Cell: Pager: Work Phone: How do you prefer we contact you? MFS Heritage Planni Divorce worksheets With so many emotions involved in the dissolution of a marriage, you ll probably want to make the financial aspects of your divorce proceed as smoothly as possible. 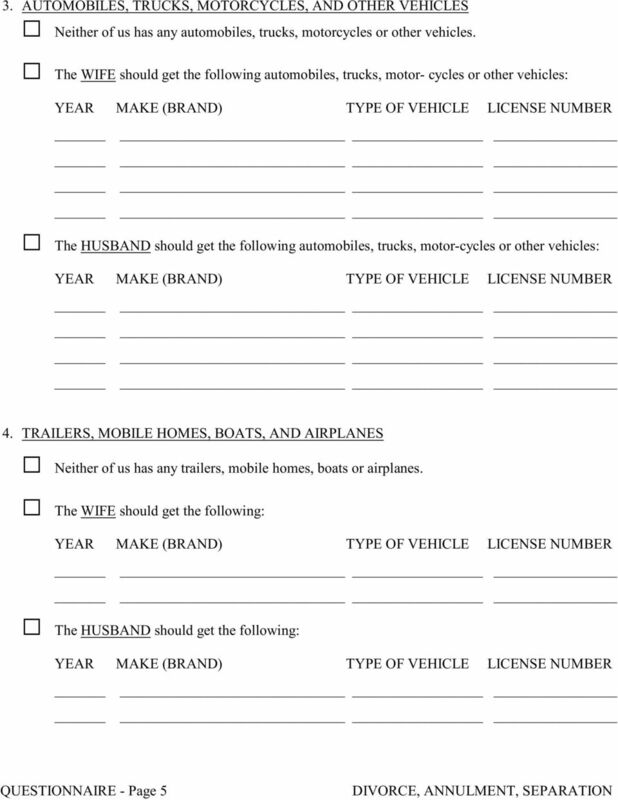 BANKRUPTCY QUESTIONNAIRE and DOCUMENT REQUEST. Documents due to your Trustee no later than TEN days prior to your Meeting of Creditors. TO: ALL DEBTOR(S) FROM: BANKRUPTCY TRUSTEE and/or UNITED STATES TRUSTEE RE: BANKRUPTCY QUESTIONNAIRE and DOCUMENT REQUEST Documents due to your Trustee no later than TEN days prior to your Meeting of Creditors. Case Number Debtor Co-Debtor Attorney YOU MUST COMPLETE THIS QUESTIONNAIRE Please SUBMIT IT TO THE TRUSTEE as soon as possible, but not later than seven (7) days before your 341 First Meeting of Creditors.